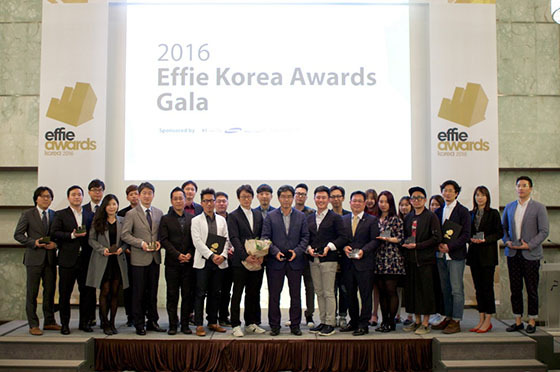 The 2016 Effie Awards Korea Gala was held on April 18 at the Plaza Hotel, with approximately 150 advertising and marketing professionals attending. The Effie Awards honor effectiveness in marketing campaigns, differentiating themselves from other advertising awards led primarily by creativity. This year’s Grand Effie was awarded to TBWA Korea and SIDIZ for their campaign, “Chairs Change One’s Life,” which focused on the fact that most modern people spend their days in chairs. The campaign received high scores for maintaining a consistent message that changing your chair will change your life, while using a different media type and approach across various target audiences. The Gold Effie Award went to Universal McCann Korea and Seagram PPL for “Three Meals a Day: Fishing Village,” which integrated brad messaging into a reality cooking show. The campaign was evaluated highly for quickly achieving brand recognition for Coca-Cola’s Seagram, a late mover in the South Korean sparkling water market. The campaign effectively used the TV show by showing the cast members drinking the product. Several tools were developed so that Seagram was not simply advertised, but introduced as content. The Silver Effie winners were HS Ad and LG Electronics Roboking for “Extreme Challenge! Season 2,” TBWA Korea and ULOS for “Men, Get ULOS Without Hesitation,” Daehong Communications and Lotte Gum for “#Gumstagram,” Cheil Worldwide and Samsung Card for “2016 Samsung Card Brand Campaign,” and Baedal Minjok (WOOWA BROTHERS) and HS Ad for “Baedal Minjok_2016 Campaign,” which also earned three Bronze Awards.